Mimi Werner performing Songburning 10 February 2018. When Swedish television produces its most prestigious live shows, NEWTON is the preferred choice on both rail and cable cam, due to its discreet features and proven reliability in live broadcast. NEWTON stabilized head enabled a moving camera just feet away from the performers and soaring views of the whole arenas with their approx. 10.000 spectators. Melodifestivalen 2018 was the 58th edition of the annual Swedish music competition, selecting the entry of Sweden to the Eurovision Song Contest in May. These ambitious qualifications consist of a 6 show tour around the country and this year these took place between 3 February and 10 March. Organized and broadcast by the Swedish state television (SVT), these events on average have 3.3 million TV viewers, which ranks these shows as the most watched programs on Swedish television. With a third of the Swedish population watching, these big budget productions are at the forefront of broadcast technology with a constant pursuit of more dynamical multi camera productions. The ambition to impress the audience is also reflected by the development of the stage from year to year. 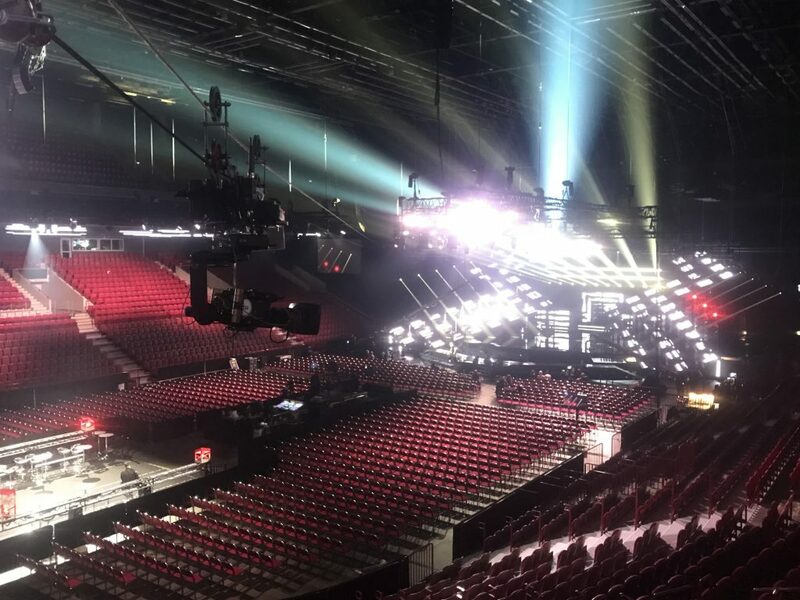 The Scenographer Viktor Brattström has been in charge of the stage for 10 years now and he explained: “This year SVT is building the tallest and widest stage so far and it’s a matter of pride to excel every year”. At the widest point, the stage was 30 meters and the artists had around 14 x 14 meters to perform, including a catwalk among the audience. The artists were flanked by 68 LED squares with 10 millimeter resolution and behind them, a LED wall with 4 millimeter resolution. “I think that is the highest resolution we have ever had and comparing to the Eurovision, it beats most years” said Viktor Brattström. 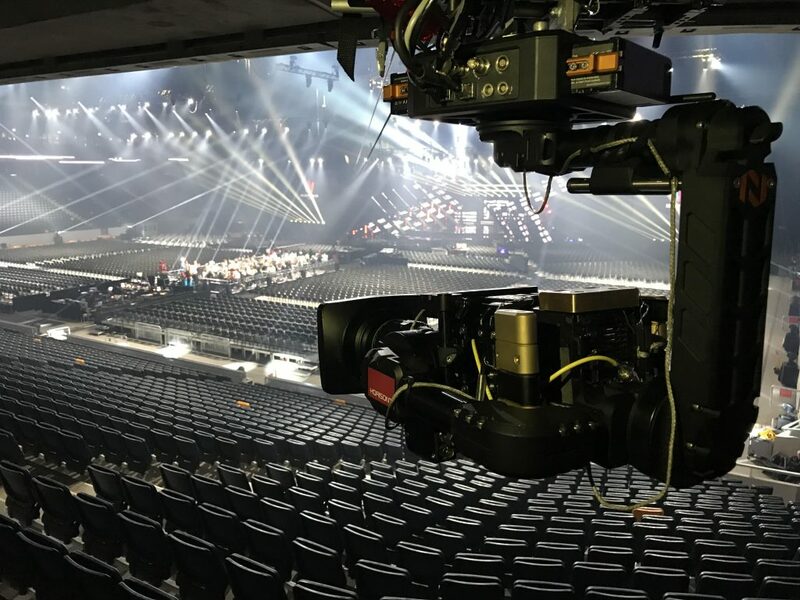 Dagsljus is a Swedish rental house for film/TV production and with the assignment to supply broadcast equipment they, among other cameras, set up a 10 meter long rail cam system between the stage and the seated audience. The system consisted of a tower dolly, moving along the rail with a NEWTON stabilized head holding a Sony P1 camera and Canon HJ14 lens. Due to the telescopic tower and the discrete features of NEWTON, the camera could be lowered below the stage while not on air plus avoid being obtrusive while on air. This gave the technical director access to a moving and panning low angle camera right in front of the performers, without disturbing the line of sight for other cameras nor the audience on site. Horisont Camera Solutions is the biggest provider of cable cam services in Sweden, and is the main provider of 1D wire solutions for live broadcast of live events such as sports and shows. They received their NEWTON head just in time for their participation in the tour last year and they returned this year, making a Sony P1 camera soar over the approx. 10.000 people in the audience in each arena. “Finally we received the power we need, with a gimbal that still is compact and lightweight. With NEWTON we can finally be confident that the footage has a level horizon (horisont in Swedish) just as our company name promises and it’s only now that we dare to exploit the full range of the cable system with high speeds, full zoom while still keeping the image steady. NEWTON is a clear notch up for our service offering of live broadcast in big arenas”. Reel of Top 12 songs, starting off with several dolly shots from NEWTON on the rail by the stage. At 1:35, that NEWTON is visible. DOMINION operator Cissi Andersson and cable dolly operator Fredrik Cruse, at Horisont Camera Solutions.